CPI(M) strongman Pinarayi Vijayan was today sworn in as Chief Minister of Kerala heading a 19-member ministry of the party-led Left Democratic Front(LDF) that had 13 new faces including two women. 72-year-old Vijayan, who pipped his bitter party rival V S Achuthanandan to the top post in Kerala politics, was administered the oath of office and secrecy by Governor Justice (Retd) P Sathasivam at the Central Stadium here. 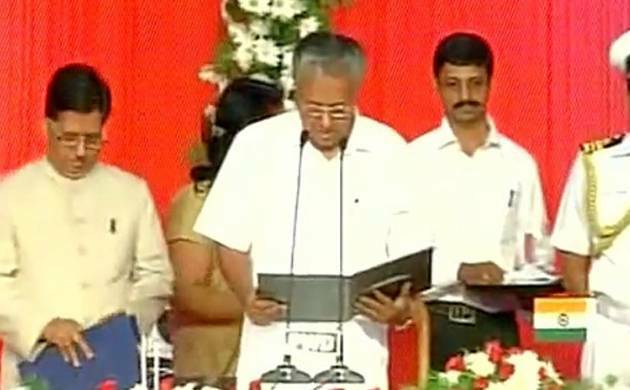 Hailing from a poor toddy tapper’s family, Vijayan, a first time Chief Minister, took the oath in Malayalam. A CPI-M Politburo member, he is the 12th chief minister of Kerala. Out of the 19-member cabinet, 12 including the Chief Minister are from CPI(M), 4 from CPI, one each from NCP, Janata Dal(S) and Congress(S). The outgoing Congress-led UDF had 21 ministers. There are 13 new faces, including two women, in the Cabinet. Five ministers had held positions in previous LDF ministries. The CPI(M)-LDF had unseated the Congress-led UDF by securing 91 seats in the 140-member House in the May 16 assembly polls. The slight drizzle failed to dampen the spirits of the party workers who had arrived in buses and other vehicles from various parts of the state, especially the northern districts of Kasaragod, Kannur and Kozhikode, to witness the swearing-in ceremony, which began at 4 pm. In 2006 also, the swearing in of then Chief Minister V S Achutanandan and his cabinet colleague was held outside the Raj Bhavan. CPI(M) and CPI ministers took the oath and made solemn pledge, while other Front ministers took the oath in the name of God. The ministers who were sworn in by the Governor are (CPI-M)) Thomas Isaac, A K Balan, G Sudhakaran, E P Jayarajan, Kadakampally Surendran, K K Shylaja, J Mercykutty Amma, T P Ramakrishnan, A C Moideen, C Raveendranath and K T Jaleel (CPI-M-IND). CPI: E Chandrasekharan, V S Sunil Kumar, P Thilothaman and K Raju. Congress S: Ramachandran Kadannappalli. NCP: A K Saseendran JD(S): Mathew T Thomas. This is also the first time that a swearing in ceremony is observing green protocol to ensure zero waste event. The capital city was a sea of red, with CPI(M) party flags and red buntings flying high in various corners. Party workers were dressed in red shirts and red caps.